Turning your entryway into an inviting, efficient transition space can lift your spirits every time you walk in the door. Follow these simple tips to upgrade your entryway, foyer, or mudroom into a stylish, organized space that will always welcome you home. Create a convenient spot for tying shoes or removing them before entering your home with a built-in bench. It also provides a handy place to set shopping bags when you come in. Choose colors, textures, and a style that complement your home and make a positive first impression. Shown here, the combination of Driftwood color with natural woodgrain texture, sleek hardware, and a White bench made of thick Forterra is one of many possibilities to express yourself. 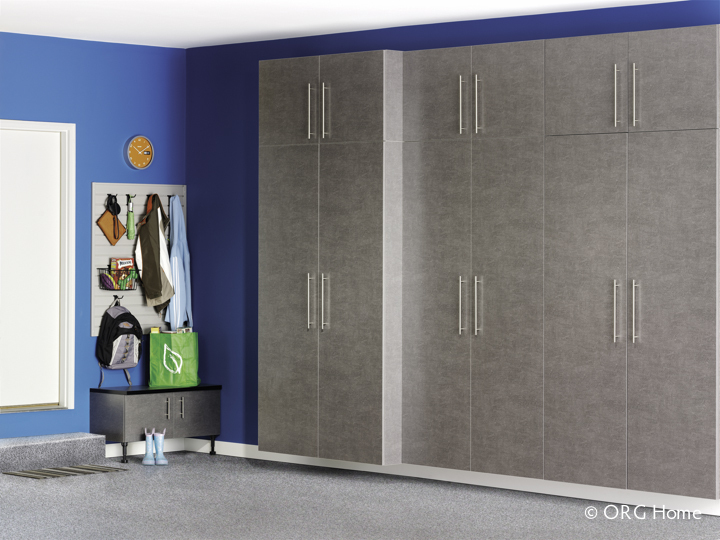 Spacious wall-to-wall storage offers room to store gear for every season, so you’ll always know exactly where to find that pair of gloves or your favorite sun hat. 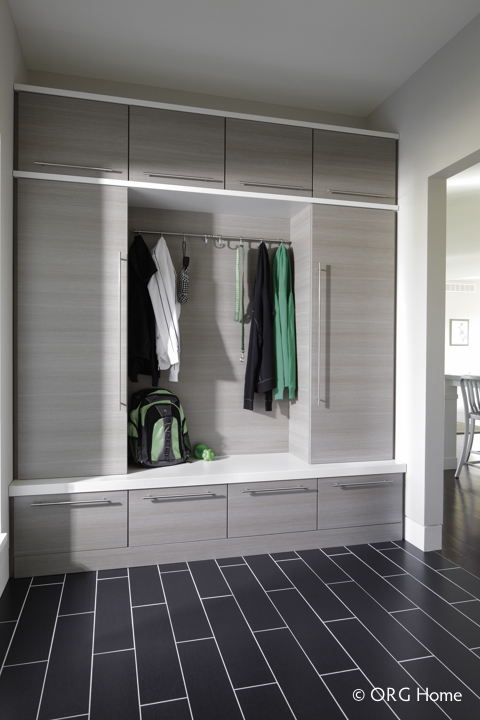 Custom designs for your home mean you can maximize storage space without wasting a single precious inch. Sturdy hooks give everyone in the family a designated spot for stashing or grabbing jackets, bags, and other everyday items. Add a few extra hooks for visitors and one for the dog’s leash. Maintain a clean and orderly appearance by storing items neatly out of sight behind cabinet doors or inside drawers. Plan a drawer for every season, sport, or family member. With a designated storage spot near the door, you’ll always remember where you put your keys, your garage door opener, or your favorite shoes. Low-profile drawers with full extension glides make it easy to find what you need at a glance when you’re in a hurry. Take advantage of underutilized space in your garage to create a mini-mudroom. Use hooks and baskets for grab-and-go convenience, and keep small items in overhead storage. A boot bench encourages people to remove shoes so your floors stay cleaner, and it offers a convenient space to set bags while you open the door. When the entrances to your home are properly equipped, it’s easy to keep these busy spaces looking clean, organized and inviting.